I use and highly recommend Sessions, a Safari Extension, made by David Yoo. Sessions gives you an easy way to save and restore sessions–groups of Safari windows and tabs. Sessions can auto-save the windows and tabs that you have open. Then you can use Sessions to easily restore all windows and tabs if Safari unexpectedly quits. Better yet, Sessions lets you build a list of sessions which can be re-opened anytime. Thus, you could build a Session for your favorite news websites or your product research websites. You can search across all of your sessions and delete specific windows or tabs from a session. Safari version 5 and above support Extensions. 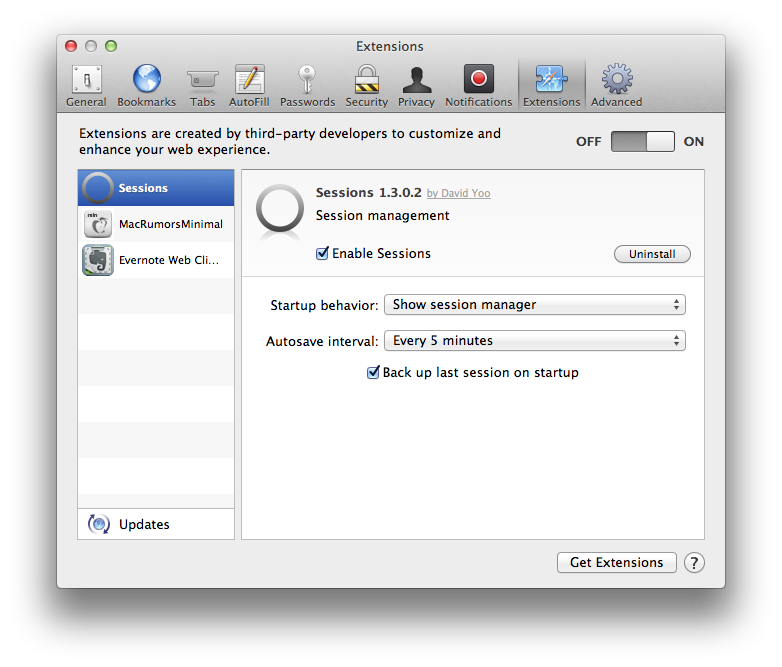 Once you install Sessions, you can manage its settings by opening Safari, going to the Safari menu and selecting Preferences. Click on the Extensions button and you’ll see Session listed on the left-hand side. Click on it to view its preferences, as depicted below. If you’re not familiar with Safari Extensions you might want to check out the Apple Gallery, which is full of thousands of other Extensions.